You would think that, having retired, I would have more time. I have been catching up on 20 years of "honey do's". One of my first priorities is to get the entrance door sealed up to keep the weather out. There's probably been more rain on that first step since coming to Indiana than in all of it's first 20 years combined. 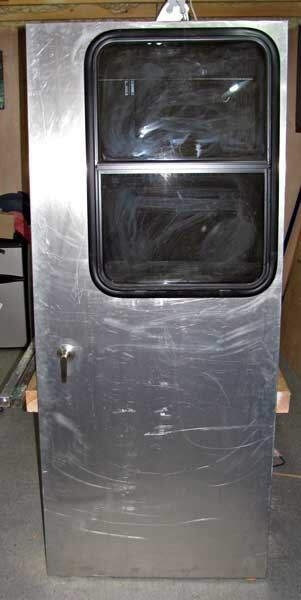 I have much of that done, but wasn't happy with the window I was going to put in it, so a trip to the rv surplus store was done yesterday and I found just what I wanted. Slight problem with the latching system I am using, but that was solved (in my head) sometime in the middle of last night. When I get it finished, I'll post some work in progress pictures. The door is coming along nicely. I wanted an ambulance door, but couldn't find one that I could afford. 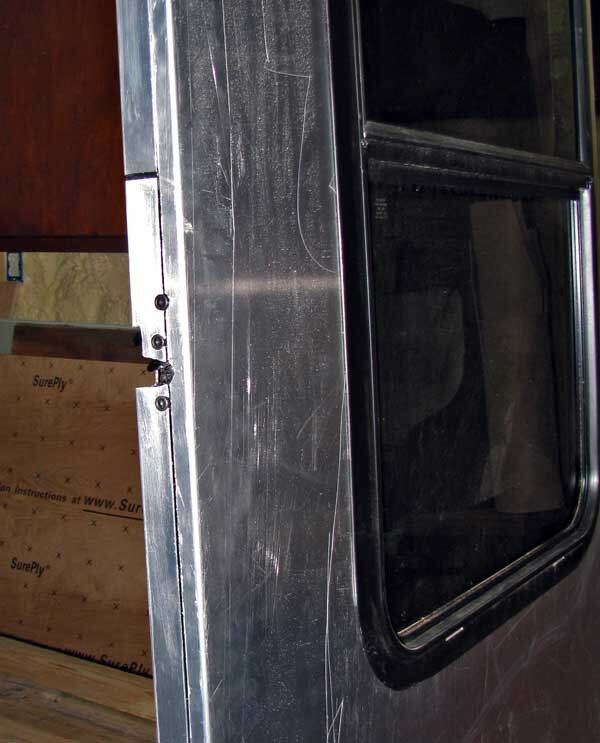 I the old door apart and moved the rear section with hinge to the front, then welded the rear section on for the right width using the full door frame. 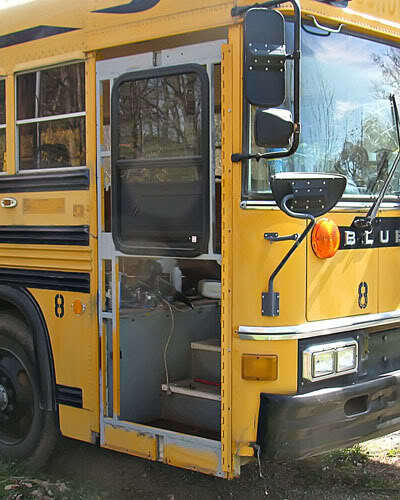 I have installed bear claw latches so that it has two latches. I still have to make the actual door knob assy and figure out a dead bolt lock. Here is a picture sans skin, with window temporarily installed.The gray painted part is the new door. Looking excellent Somewhere! --- Just wish I had the original door for my '46, I'd do the same. Damn Hippies tore it out and installed a wooden piece of crap that was falling apart. The replacement I am building is steel framed and a real bear to put together. Turns out the bus has an almost invisible set of subtle curves I have to work around that has made it far more challenging than the flat slab I'd figured on making. Ahhh...the joys of crafting! It's been quite some time since my last post,it seems like I've been working on the door FOREVER. I FINALLY got it ready to hang. I scrapped the first door I was working on, when I got ready to put the skin on I discovered that the original was bowed quite badly along the side the hinge was on. Rather than try to redo it I bought new steel and started from scratch. It seems I had to rethink things a number of times. I wasted a lot of time trying to bent the skin myself, I just couldn't build a bender strong enough. The shop I took it to did an excellent job. I think the finished door came out quite nice. One problem is I'm going to have to wait till my son comes down for Christmas to help hang it. It's heavier than I want to try by myself. Indeed it did! Very nice. Door came out looking really nice!!! Hey Somewhere...looks super! Still working on mine but hope it turns out half as nice. 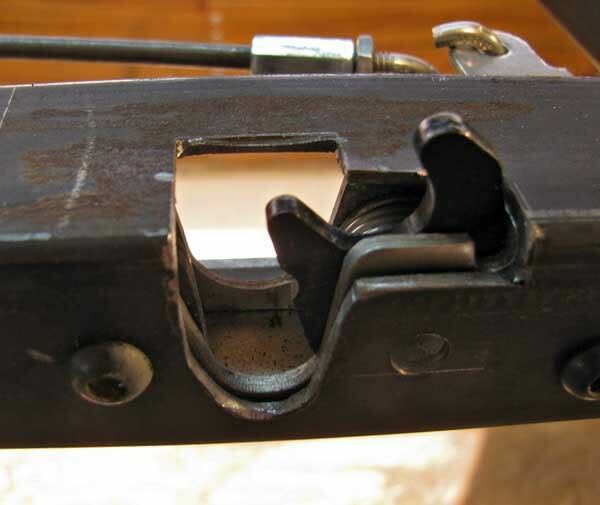 Are the double latches and handle set up from an RV or where did you get it? The rest I kinda put together myself. The handles are from a RV surplus place and are supposed to be interior I hope they don't go bad too soon.